However, the membrane-associated and hydrophobic nature of the enzyme system impeded purification, and the number of proteins involved could not be accurately counted. Advances in mRNA purification in the early 1980s allowed to isolate the first cDNA encoding a complete cytochrome P450 (CYP) protein, and thereafter, results of many cloning studies have revealed a big amount of different enzymes. Cholesterol 7 alpha-hydroxylase is the rate-limiting enzyme in the synthesis of bile acid from cholesterol via the classic pathway, catalyzing the formation of 7-alpha-the thydroxycholesterolThe unique detergent properties of bile acids are essential for the digestion and intestinal absorption of hydrophobic nutrients. Bile acids have powerful toxic properties like the membrane disruption and there are a wide range of mechanisms to restrict their accumulation in tissues and blood. The discovery of farnesoid X receptor (FXR) which is located in the liver, has opened new insights. Bile acid activation of FXR represses the expression of CYP7A1 via, raising the expression of small heterodimer (SHP), a non-DNA binding protein. Disruption of CYP7A1 from classic bile acid synthesis in mice leads to either increased postnatal death or a milder phenotype with elevated serum cholesterol. The latter is similar to the case in humans, where CYP7A1 mutations associate with high plasma low-density lipoprotein and hepatic cholesterol content, as well as deficient bile acid excretion. There is also a synergy between plasma low-density lipoprotein cholesterol (LDL-C) and risks of coronary artery disease (CAD). Glucose signaling also induces CYP7A1 gene transcription by epigenetic regulation of the histone acetylation status. Glucose induction of bile acid synthesis have an important implication in metabolic control of glucose, lipid, and energy homeostasis under normal and diabetic conditions. CYP7A1-rs3808607 and APOE isoform are associated with the extent of reduction in circulating LDL cholesterol in response to PS(define PS, Plant Sterol?) consumption and could serve as potential predictive genetic markers to identify individuals who would derive maximum LDL cholesterol lowering with PS consumption. Genetic variations in CYP7A1 influence its expression and thus may affect the risk of gallstone disease and Galbaldder Cancer. ↑ Cohen JC, Cali JJ, Jelinek DF, Mehrabian M, Sparkes RS, Lusis AJ, Russell DW, Hobbs HH (Sep 1992). "Cloning of the human cholesterol 7 alpha-hydroxylase gene (CYP7) and localization to chromosome 8q11-q12". Genomics. 14 (1): 153–61. doi:10.1016/S0888-7543(05)80298-8. PMID 1358792. ↑ Miao J (2008). Regulation of Bile Acid Biosynthesis by Orphan Nuclear Receptor Small Heterodimer Partner (Ph.D.). University of Illinois at Urbana-Champaign. 1 2 3 4 5 Nebert DW, Russell DW (2002). "Clinical importance of the cytochromes P450". Lancet. 360 (9340): 1155–62. doi:10.1016/S0140-6736(02)11203-7. PMID 12387968. 1 2 3 4 5 6 7 8 9 Chiang JY (October 2009). "Bile acids: regulation of synthesis". J. Lipid Res. 50 (10): 1955–66. doi:10.1194/jlr.R900010-JLR200. PMC 2739756 . PMID 19346330. ↑ "RCSB PDB". RCSB PDB. Retrieved 2015-10-18. ↑ "Síntesis de Ácido Biliar, el Metabolismo y las Funciones Biológicas". Retrieved 2015-10-15. 1 2 3 Chawla A, Saez E, Evans RM (Sep 2000). "Don't know much bile-ology". Cell. 103 (1): 1–4. doi:10.1016/S0092-8674(00)00097-0. PMID 11051540. ↑ Hedstrom L (2010). "Enzyme Specificity and Selectivity". ELS Citable Reviews in the Life Sciences. doi:10.1002/9780470015902.a0000716.pub2. ↑ Paumgartner G, Sauerbruch T (Nov 1991). "Gallstones: pathogenesis". Lancet. 338 (8775): 1117–21. doi:10.1016/0140-6736(91)91972-W. PMID 1682550. ↑ Li T, Chanda D, Zhang Y, Choi HS, Chiang JY (Apr 2010). 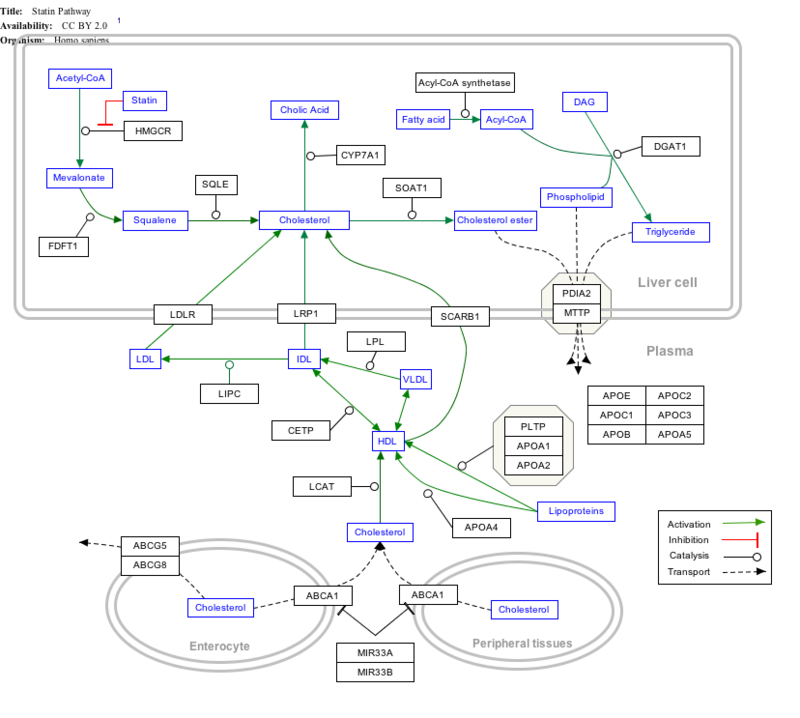 "Glucose stimulates cholesterol 7alpha-hydroxylase gene transcription in human hepatocytes". Journal of Lipid Research. 51 (4): 832–42. doi:10.1194/jlr.M002782. PMC 2842145 . PMID 19965590. ↑ MacKay DS, Eck PK, Gebauer SK, Baer DJ, Jones PJ (Oct 2015). "CYP7A1-rs3808607 and APOE isoform associate with LDL cholesterol lowering after plant sterol consumption in a randomized clinical trial". The American Journal of Clinical Nutrition. 102 (4): 951–7. doi:10.3945/ajcn.115.109231. PMID 26333513. ↑ Srivastava A, Choudhuri G, Mittal B (2010). "CYP7A1 (-204 A>C; rs3808607 and -469 T>C; rs3824260) promoter polymorphisms and risk of gallbladder cancer in North Indian population". Metab. Clin. Exp. 59 (6): 767–73. doi:10.1016/j.metabol.2009.09.021. PMID 20005541. ↑ Gbaguidi GF, Agellon LB (2004-01-01). "The inhibition of the human cholesterol 7alpha-hydroxylase gene (CYP7A1) promoter by fibrates in cultured cells is mediated via the liver x receptor alpha and peroxisome proliferator-activated receptor alpha heterodimer". Nucleic Acids Research. 32 (3): 1113–21. doi:10.1093/nar/gkh260. PMC 373396 . PMID 14960721. Holmes MV, Shah T, Vickery C, Smeeth L, Hingorani AD, Casas JP (2009). Luo Y, ed. "Fulfilling the promise of personalized medicine? Systematic review and field synopsis of pharmacogenetic studies". PLOS ONE. 4 (12): e7960. doi:10.1371/journal.pone.0007960. PMC 2778625 . PMID 19956635. Li T, Chanda D, Zhang Y, Choi HS, Chiang JY (Apr 2010). "Glucose stimulates cholesterol 7alpha-hydroxylase gene transcription in human hepatocytes". Journal of Lipid Research. 51 (4): 832–42. doi:10.1194/jlr.M002782. PMC 2842145 . PMID 19965590. Li T, Ma H, Park YJ, Lee YK, Strom S, Moore DD, Chiang JY (Oct 2009). "Forkhead box transcription factor O1 inhibits cholesterol 7alpha-hydroxylase in human hepatocytes and in high fat diet-fed mice". Biochimica et Biophysica Acta. 1791 (10): 991–6. doi:10.1016/j.bbalip.2009.05.004. PMC 2743791 . PMID 19463968. Voora D, Shah SH, Reed CR, Zhai J, Crosslin DR, Messer C, Salisbury BA, Ginsburg GS (Dec 2008). "Pharmacogenetic predictors of statin-mediated low-density lipoprotein cholesterol reduction and dose response". Circulation. Cardiovascular Genetics. 1 (2): 100–6. doi:10.1161/CIRCGENETICS.108.795013. PMC 2995295 . PMID 20031551. Beigneux A, Hofmann AF, Young SG (Jul 2002). "Human CYP7A1 deficiency: progress and enigmas". The Journal of Clinical Investigation. 110 (1): 29–31. doi:10.1172/JCI16076. PMC 151039 . PMID 12093884. Ruaño G, Bernene J, Windemuth A, Bower B, Wencker D, Seip RL, Kocherla M, Holford TR, Petit WA, Hanks S (Feb 2009). "Physiogenomic comparison of edema and BMI in patients receiving rosiglitazone or pioglitazone". Clinica Chimica Acta; International Journal of Clinical Chemistry. 400 (1-2): 48–55. doi:10.1016/j.cca.2008.10.009. PMID 18996102.